15th Shabaan. 13th Rajab. 15th Ramadhan. All dates that have significance, in our minds and in the mind of a child that attends regular programs for the Birthdays of our Imams. But what’s the birth date of our 8th Imam? To be honest, I’d have to look it up. I learned it at one point, in a Sunday School class, I’m sure, but it didn’t stick. 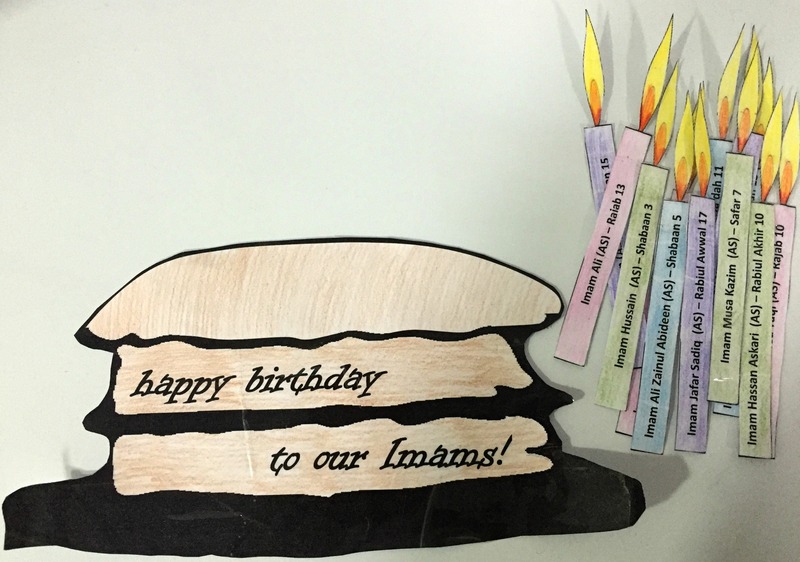 Here’s a way to help all the birthdays of the Imams stick in the brains of our children! All you have to do is print out the files, which are available at the bottom of this post. You can enlist the help of your child to color the cake and the candles, but I decided to color mine myself! If you wish, you can laminate your cake and candles. To put the pieces together, you can use Velcro or magnets if you’d like, but you can leave it loose as well. 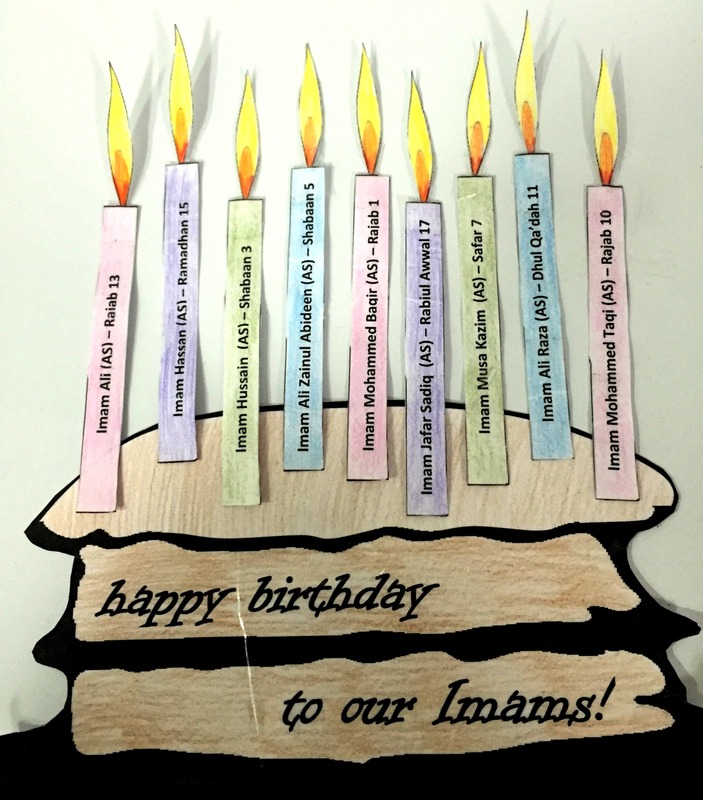 On the birthday of each Imam, pull out the cake and candles, and mention which Imam’s birthday it is. The child will then have to find the candle that corresponds to the Imam, as well as all those that came before. Let’s use the 10th Imam as an example. 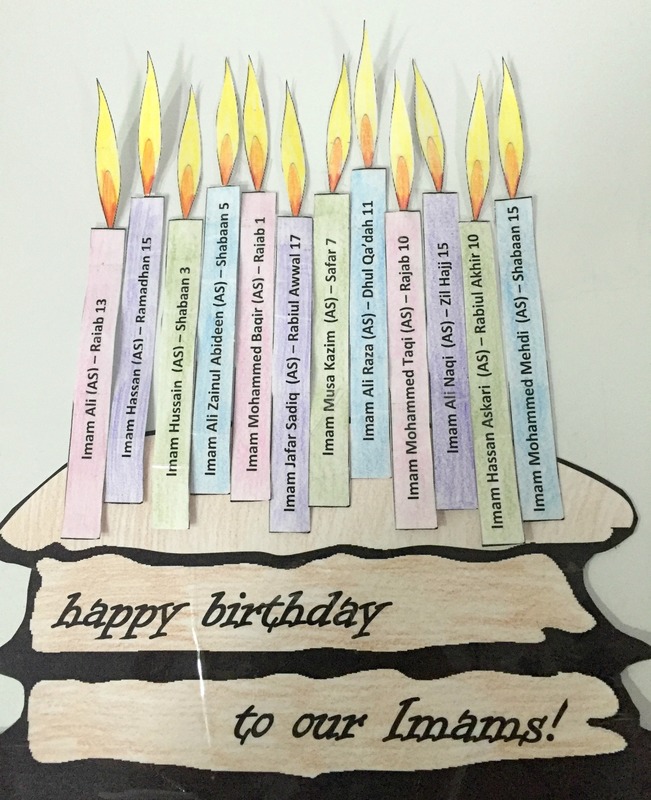 The child would need to find the candle that has the name and birthdate, but because we are talking about the 10th Imam, he would also have to find the candles that correspond for the 1st through 9th Imams, so that we can put 10 candles on the cake! Of course, you can adjust the activity according to the age of the child. If the kids are younger, you can just use the cake to get them excited (because who doesn’t love birthday cakes?!) and to expose them to dates. As they get older, you can use it in more ways. This cake and all the candles are available Teaching Young Muslims Resource Library! Enter your name and email address here to receive the password to access these downloads. Already signed up? Enter the library HERE. Once you enter the library, click on “Sha’baan” and the “cake” and the “candles” are available at the very top of the page. This is one of my favorite activities, ever. We try to use it for every wiladat – if I forget, my daughter reminds me! Have you used this activity? What was your experience? Let me know – leave me a comment below! Love this! Thank you for coming to the rescue. I needed an idea for my toddler group project today. I’m printing these at the moment!! Thank you thank you!